The early Digg was brilliant and honest and democratic. Each digg was a vote and each vote counted towards the ultimate objective: moving a story closer and closer to the top position on the Digg homepage. Today, we vote on Facebook with every share and on Twitter with every tweet, and conversations take place across loads of different sites, apps, and networks. So how do we surface “what the Internet is talking about,” when the Internet is talking beyond the walls of Digg.com? We tear down the walls. 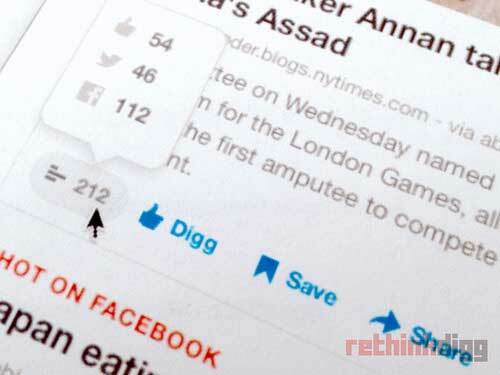 When we launch v1, users will continue to be able to digg stories, but Digg scores will also take into account Facebook shares and tweets. Roll over any Digg score to see the breakdown. We’re excited to see how this new data can help us identify the best stories on the web. Previous Previous post: The hilarious South Korean hip hop video, Gangnam Style – best music video of the year?